From these basic styles, I can customize to better match your needs. 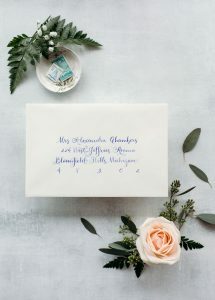 For example, if you’ve purchased your invitation elsewhere and hired me for envelope addressing, I’ll choose the calligraphy style I offer closest to your chosen design, but then also make sure to match “key” letters from your invitation suite on your envelopes. 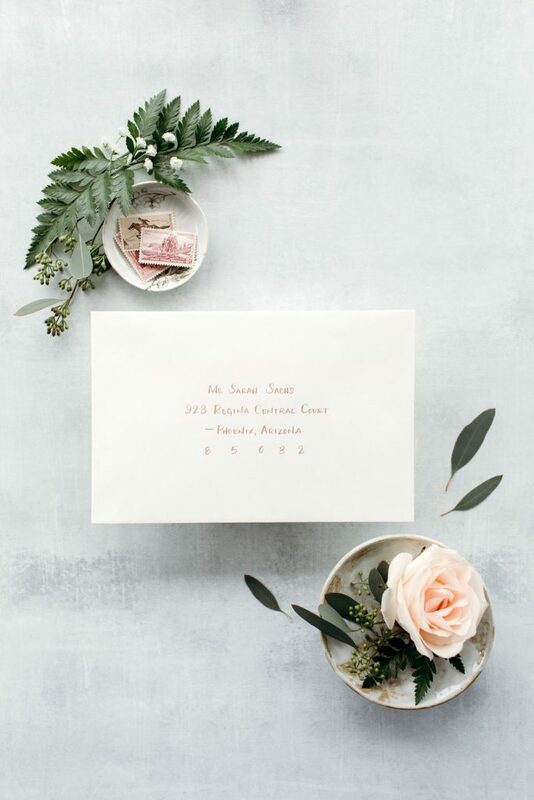 Think – your initials, your venue’s name, that sort of thing. 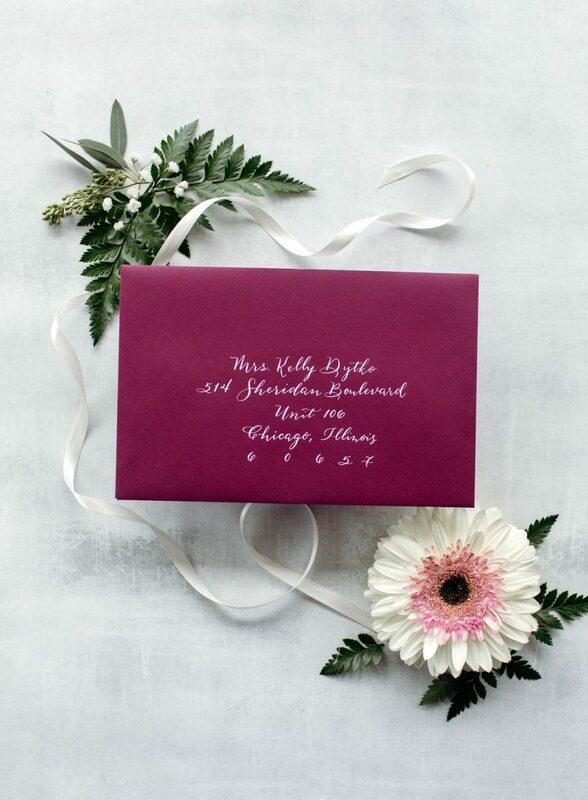 This thoughtfulness ensures seamless coordination from the outside of your envelopes to the inside stationery. Cohesion is so important! You can also make choices about layout and ink color, which we’ll discuss together. Connecting with clients (and geeking out over beautiful paper) is one of my favorite things about my job. 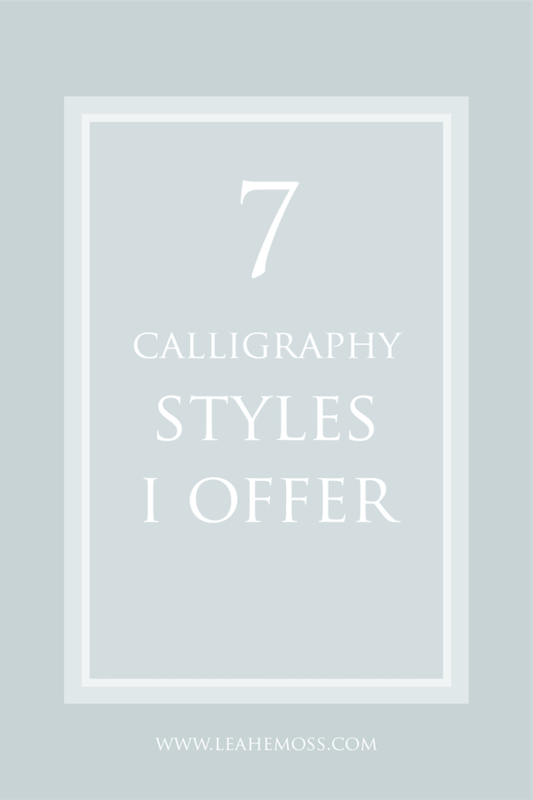 So, without further ado, let’s get to the seven styles of calligraphy I offer. Thanks so much to Casey Brodley for the amazing photographs of each one. They’re all named for ladies in my life who mean so much to me – I thought that’d be way more fun than “style A” or “style 1” – don’t you think? 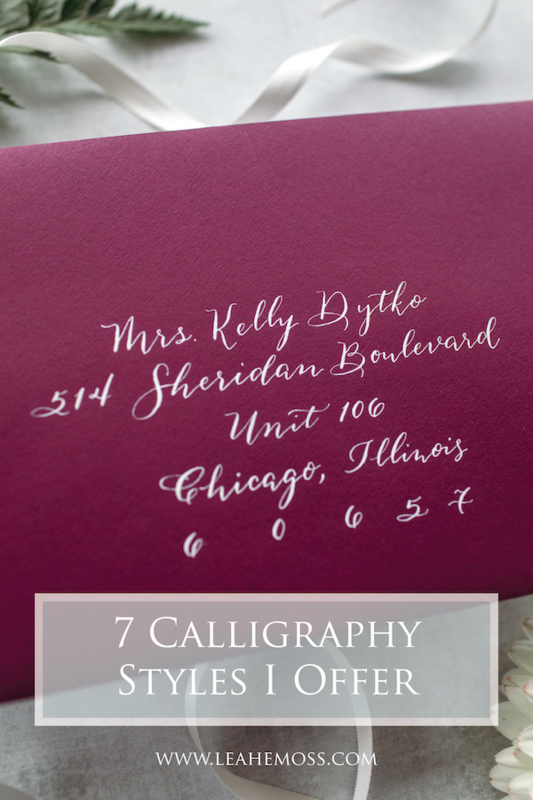 This modern calligraphy style I offer is ultra-feminine. It has curly-cues and flourishes, and the letters are written totally upright and vertical. Aside from weddings, I often use this for bridal showers and baby showers. 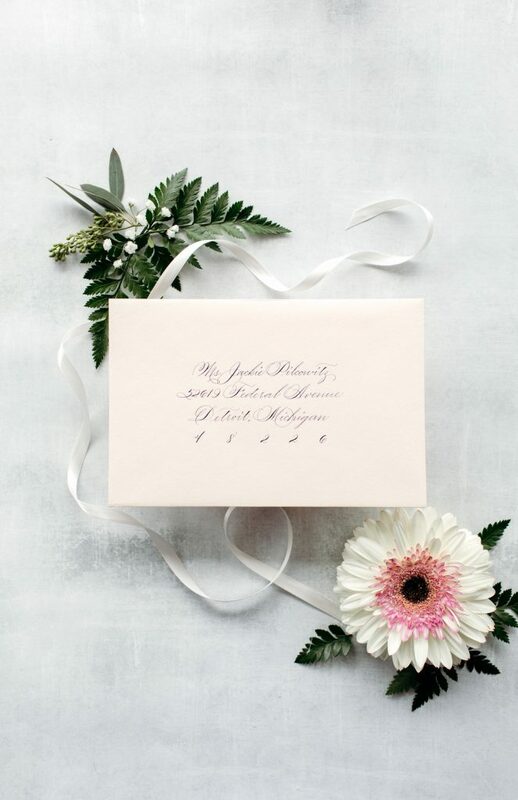 Paired with a clean, modern block font, this works beautifully as the heading on an invitation suite, too. This calligraphy style I offer is truly classic. Its technical, broad name is Copperplate. This historic hand is written at a 55 degree angle and is easy to read, while also showcasing timeless elegance. Using this script is a traditional, sophisticated, and understated option. It works well for lots of weddings, because it’s a broadly used script. This option is similar to “The Elana” in that they’re both Copperplate scripts. However, this calligraphy style I offer has a lot of flourishing as part of it. The details swirling around, or connected to, the letters are flourishes. These add a great deal of elegance to your piece, making this style ideal for a black tie affair. 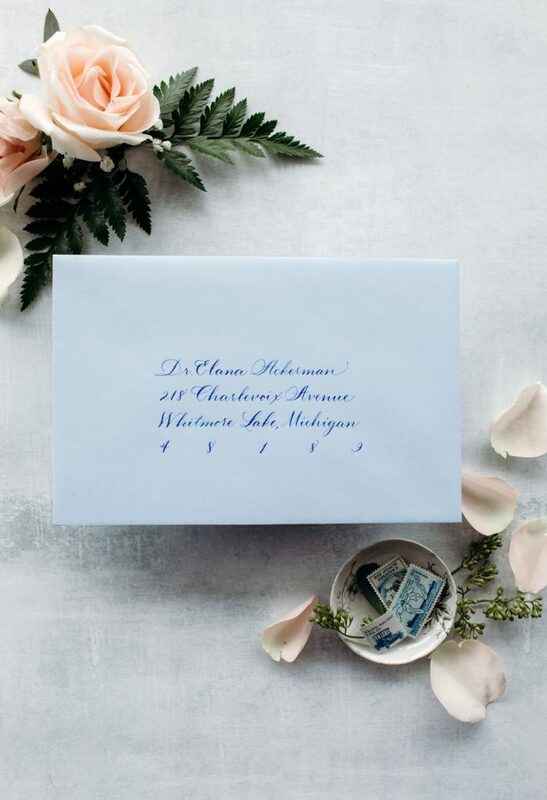 This is a calligraphy style that blends print with cursive. This hybrid writing style feels really approachable and works well for a an event with a laid-back vibe. 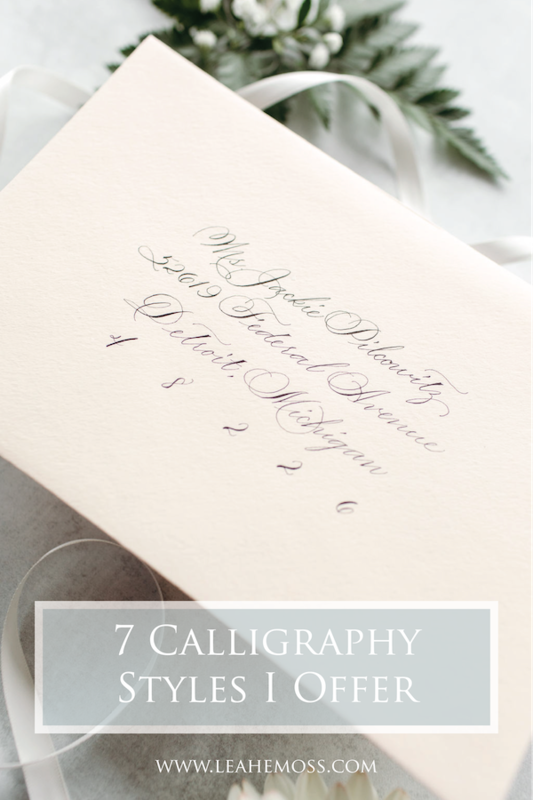 This calligraphy style I offer is an American classical script, broadly known as Spencerian. This historic hand is written at a 52 degree angle and oozes sophistication. Using this script is a traditional, elegant, and upscale option. 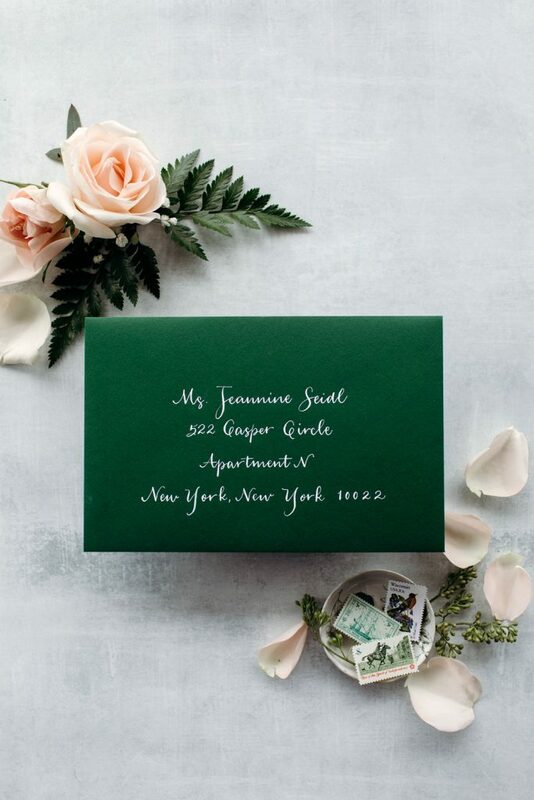 It works well for formal weddings, because it’s a timeless script. This calligraphy style I offer is modern, with a bounce across the letterforms – while still being legible. 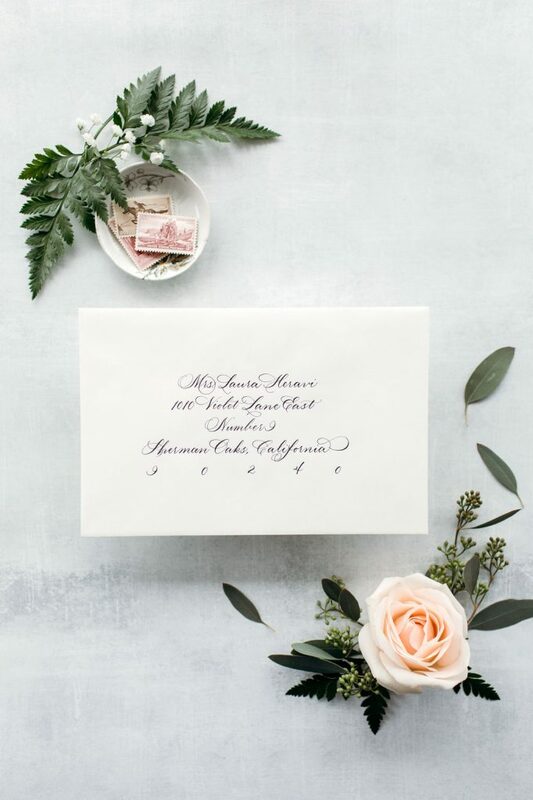 The contemporary script is well suited for a trendy couple who’s always looking to incorporate the newest luxuries into their day. Last but not least, this calligraphy style I offer is a simple block print. Usually, this is combined with one of the other styles for a mixed-use envelope. For example, the recipient’s name written in script, and then her address written beneath it in this print style. Did you see something you loved? I’d be honored to assist you with your next project, incorporating one of these styles. Want to keep these calligraphy styles in mind for your own wedding planning? Pin one of these for later!